Paragon Kilns For Bead Annealing, Enamelling, Silver Clays, Glass, Ceramics, Heat Treating, Lamp Work, Knives, And Porcelain. Alhough I've previewed four popular kilns below, the whole range of kilns is not described on this page. So switch to Paragon Kilns using the link above the menu bar near the top of the page. Learn about the Paragon SC2, SC2 Pro, SC3, BlueBird, Caldera, CS ClamShell, Darby, Dragon, F Elite, FibreFuse, FireFly, Fusion, GL, HomeArtist, HT, Iguana, Janus, KM, Ovation, Pearl, PMT, TNF, Trifecta, Trio, Viking, Vulcan, W, and Xpress kilns. For a quick photo preview of some of the kilns, click the Cherry Heaven TV player above. This shop is shared with other Cherry Heaven resources. If you don't want to read about kilns and only want to check prices or buy now, use the shop link below the menu bar near the top-right of any page. They're for UK-EU voltage, CE-marked, TUV tested, and CL and CSA approved kilns, with safety switches, and include comprehensive manuals and UK VAT. A Quick Look At The Paragon SC2, Xpress E12T, KM18T, and CS16D. I've previewed four popular kilns, below. However, to learn more about them, or other kilns, use the links below the menu bar near the top of the page. Then, for prices, use the shop link. They're typically used for making jewellery, annealing beads and glass, fusing glass, firing metal clays, firing ceramics, earthenware, porcelain, pottery, and stoneware, painting china, crucible work, applying decals, dental work, fusing dichroic glasses, enamelling, fire polishing, glass art, glass casting, fusing, sagging, and slumping, glass clays, forming glass panels, heat treating, knife making, laboratory testing, lampwork, lost-wax casting, melting gold and silver, firing bronze and copper metal clays, moulding gun and model parts, pâte de verre, raku, sintering gold and silver clays, staining glass, hardening, and tempering blades, cutters, dies, and tools, and many other materials and processes. Small kilns are more economic for jewellery-making, so you can use most popular small-scale materials such as Accent Gold, Art Clay metal clays, BullsEye glasses, dichroic glasses, enamels, GlasClay, Image Transfer Solution, Metal Clay Veneer, PMC silver clay, Prometheus bronze clay, ProCopper clay, and SilverEtch. And there's an increasingly diverse range of other metal clays, such as Cinter, Clay Mania, Creative, Goldie, Hadar Jacobson, Metal Adventures, Meteor, Noble, and PMC Sterling Silver. You can make architectural parts, badges, beads, bowls, bracelets, brooches, buttons, candle holders, ceramic-art, charms, china dolls, decorations, earrings, figurines, fingerprint keepsakes, flowerpots, glass-art, glass panels, jewellery, knives, lampshades, medals, miniatures, models, mugs, necklaces, ornaments, pendants, plates, porcelain beads, pet-id tags, rings, souvenirs, stained-glass designs, tableware, thimbles, tiaras, tiles, tools, trinkets, and vases, as unique hand-crafted pieces or repeatable stock for sale. They're ideal for your arts centre, ceramics studio, science college, course venue, craft studio, dental or medical laboratory, engineering facilty, glass works, jewellery studio, knife-making workshop, machine shop, metal-work factory, pottery business, research unit, school, technical facility, or university. The Paragon SC2 Kiln For Art Clay And PMC Silver Clays, Bead Annealing, Dichroic Glasses, Enamelling, Glass Fusing, And Metal Clays. The Paragon SC2 is a 1095°C, square, front-opening, plug-in, table-top, ceramic fibre kiln, with a ramp-hold Sentry Xpress 3-key digital programmer. In Paragon blue, or customised berry, black, jade, navy, pink, purple, or turquoise. The Paragon SC-2 comes in four versions: the SC-2 with a plain door, the SC-2B with a bead-annealing door, the SC-2W with a heat-resistant viewing-window, and the SC-2BW with a bead door and window. The SC3, SC3B, SC3W, and SC3BW are similar, but larger. The 925°C SC4 is similar, but over four times larger. There are also three stylish professional versions with stainless-steel doors, stay-cool wooden door-handles, silent long-life solid-state relays, and tilted easy-view ramp-hold Sentry Xpress 3-key or Sentry 12-key digital programmers. 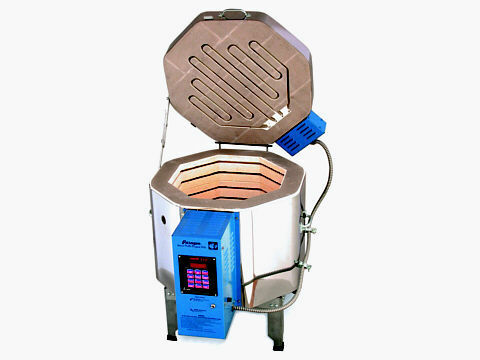 The Paragon SC2 is probably the most popular kiln in the UK and ideal for a home hobby, small business, or studio. You can fire metal clays on several shelves, anneal beads on five mandrels, do enamelling, fuse glass, and heat-treat metals. Some bronze and copper clays need to be embedded in activated charcoal granules in a stainless steel container: the SC-2 can hold a one-litre container. You can buy charcoals and pans in the on-line shop. To learn more about the Paragon SC2 kiln, click here, or use the sc2-sc3 link near the top of the page, then use the shop link. Prices include UK VAT, a pro shelf kit, comprehensive instructions, and UK-mainland delivery. The Paragon Xpress E-12A Kiln For Annealing, Ceramics, Dichroics, Enamels, Glass Fusing, Heat Treating, Metal Clays, And Porcelain. The Paragon Xpress E12A is a 1230°C, rectangular, front-opening, plug-in, table-top, firebrick kiln, with a ramp-hold Sentry Xpress 3-key digital programmer. In Paragon blue, or customised berry, black, navy, pink, purple, or turquoise. The Paragon Xpress E-12A comes in four versions: the E-12A with a plain door, the E-12AB with a bead-annealing door, the E-12AW with a heat-resistant viewing-window, and the E-12ABW with a bead door and a window. The Q-11A, E-9A, and E-10A are similar, but smaller. The 1095°C E-14A is 1.73 times larger. The UK-EU Xpress E12A, made for Cherry Heaven, heats to 1230°C and is 221mm high inside. It can be upgraded to 1260°C or 1290°C. The UK-EU and US versions are not the same. The US E12A only heats to 1095°C and is 152mm high inside, and the E12T only heats to 1095°C but is 221mm high inside. 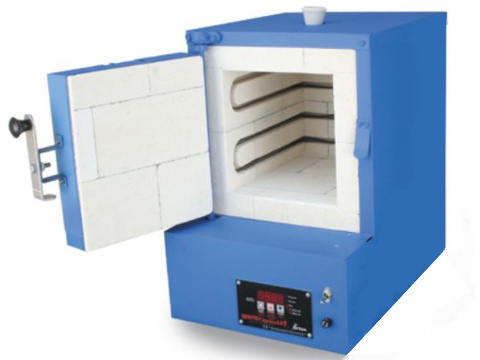 The Paragon E12A is probably the most popular mixed-media kiln in the UK and ideal for materials and processes that need a long, high-temperature, firing sequence. Because it can use a regular 13A socket. You can anneal beads on five mandrels, make tiles, small plates, and bowls, work with ceramics and porcelain, and fire silver clay on several shelves. Some bronze and copper clays need to be embedded in activated charcoal granules in a stainless steel container: the Xpress E-12A can hold a three-litre container. You can buy charcoals and pans in the on-line shop. 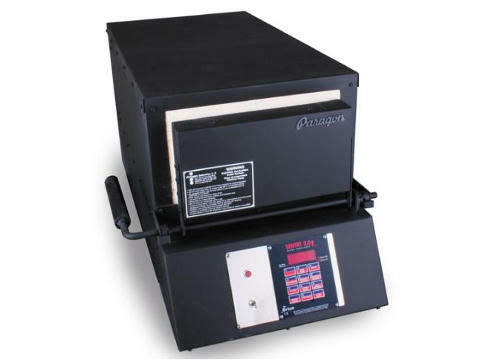 To learn more about the Paragon Xpress E12A kiln, click here, or use the xpress link below the menu bar near the top of the page, then use the shop link. Prices include UK VAT, a pro shelf kit, and comprehensive instructions. The Paragon KM18D Kiln For Making Knives, Blades, Cutters, Dies, Tools, And Gun Parts, Heat-Treating Metals, And Annealing Glass. There are seven in the series: the KM-14T, KM-18T, KM-18T XL, KM-24T, KM-24T XL, KM-36T, and KM-45T, in ascending order of firing chamber depth, the number being the approximate interior depth in inches. The KM-18T XL and KM-24T XL are twice as wide as the KM-18T and KM-24T. In the US, the XL kilns are called double-barrel. 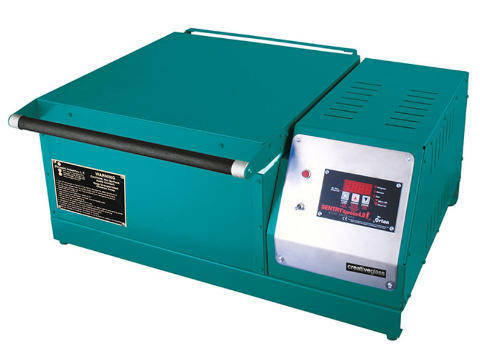 The Paragon KM is probably the most popular knife kiln in the UK, EU, and US, and ideal for materials and processes that need a long, stable, high-temperature, heat-treating sequence. To learn more about the Paragon KM18T kiln, click here, or use the xpress link below the menu bar near the top of the page, then use the shop link. Prices include UK VAT, comprehensive instructions, and a heat-treating guide. The Paragon Fusion CS16D Kiln For General Glass Work, Annealing, Casting, Fusing, Sagging, and Slumping. The Paragon Fusion ClamShell CS16 comes in two versions: the CS16S which has an opening lid, and the CS16D which has an opening lid and an opening body giving an easy-access flat surface for arranging glasswork. So, S means single opening and D means double opening. The CS16SB has two bead-annealing doors, and the CS16SW has a heat-resistant viewing window. These two options are not available on the CS16D: as the top is in two parts, it would be weakened by cut-outs for bead doors and windows. The CS14 is similar, but smaller. The CS19 and CS26 are similar, but larger, so need to be wired in. The Fusion CS16D is the largest glass kiln that can use a regular 13A socket You can anneal beads on ten mandrels, batch-fire silver clay, and make glass art, panels, tiles, plates, and bowls. To learn more about the Paragon Fusion CS16 kiln, click here, or use the cs-fusion link below the menu bar near the top of the page, then use the shop link. Prices include UK VAT and comprehensive instructions. Internet retail is an unchecked arena: everything is described as the best, the newest, or the cheapest, and is being sold by the premier dealer. On-line kiln prices can be misleading: UK VAT, delivery, programmers, shelf kits, options, and upgrades, are often obscured, and only show up when you finally have to pay. And sales-centric companies don't provide the valuable services that we do: comprehensive advice, competent technical support, a prompt repair workshop, and free telephone time if you want to fit parts yourself. UK and EU Safety Regulations. Ceramic-fibre kilns generally have heating elements that are safey embedded in the rigidised fibre: so there's no danger of a mains-voltage electric shock. However, US-made firebrick kilns have elements in recessed grooves that are exposed whenever the kiln is open. UK and EU regulations require an additional switch, included in the price, which cuts off the power whenever the door or lid is opened. It'll be too late to think about safety practices after an accident. Apart from kiln accessories, the on-line shop includes heat-resistant ceramic blocks and cloths, digital reminder-timers, fire extinguishers, heat-resistant gloves, glare-resistant glasses, and clear protective glasses. All particulates represent a health risk if they're breathed in, so it's very important to wear a HEPA mask when mixing powders, handling charcoal, sanding dried metal-clays, and cleaning out your kiln. Ideally, use protective glasses. It's important to have your fire extinguisher near your kiln. Read the instructions as soon as you unpack it, learn how to treat burns, buy a basic first aid kit, and fit a smoke alarm. Although I've never heard of a fire caused by a kiln. Accessories, Materials, Tools, And Tumblers. There's a wide range of kiln options, accessories, spare parts, materials, precision tools, safety equipment, and tumblers. To learn more, use the accessories link below the menu bar near the top of the page.